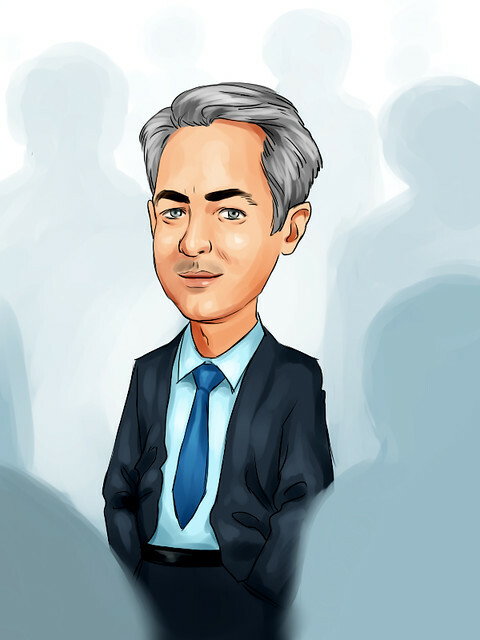 United Technologies Corporation (UTX) Management Utilizing Equity Efficiently? 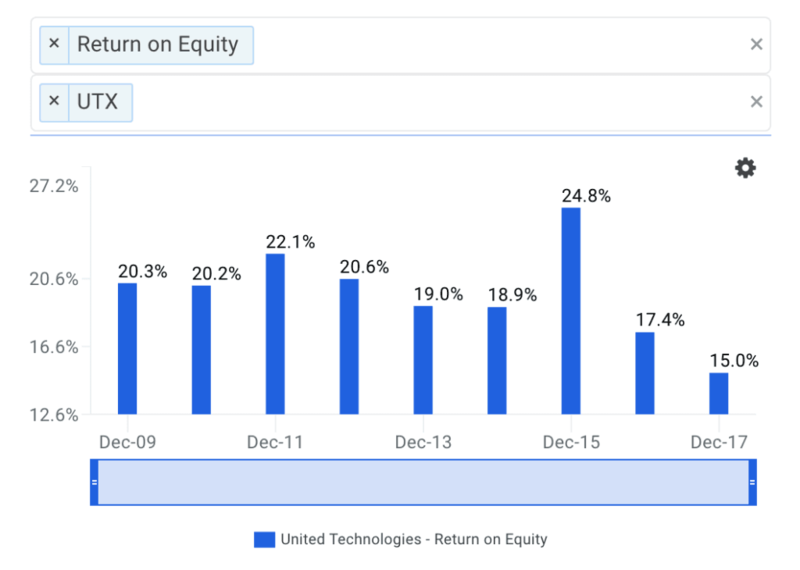 United Technologies Corporation (NYSE: UTX) ‘s most recent return on equity was an above average 15.0% in comparison to the Industrials sector which returned 10.1%. Though UTX’s performance over the past twelve months is impressive, it’s useful to understand how the company achieved its healthy ROE. Was it a result of profit margins, operating efficiency or maybe even leverage? Knowing these components may change your views on UTX and its future prospects. The return on equity of UTX is shown below. Unfortunately for shareholders, UTX's return on equity has decreased each year since 2015. ROE decreased from 24.8% to 17.4% in fiscal year 2016, decreased to 15.0% in 2017 and the LTM period is also its latest fiscal year. So what's causing the steady decline? So let's take a closer look at the drivers behind UTX's returns. 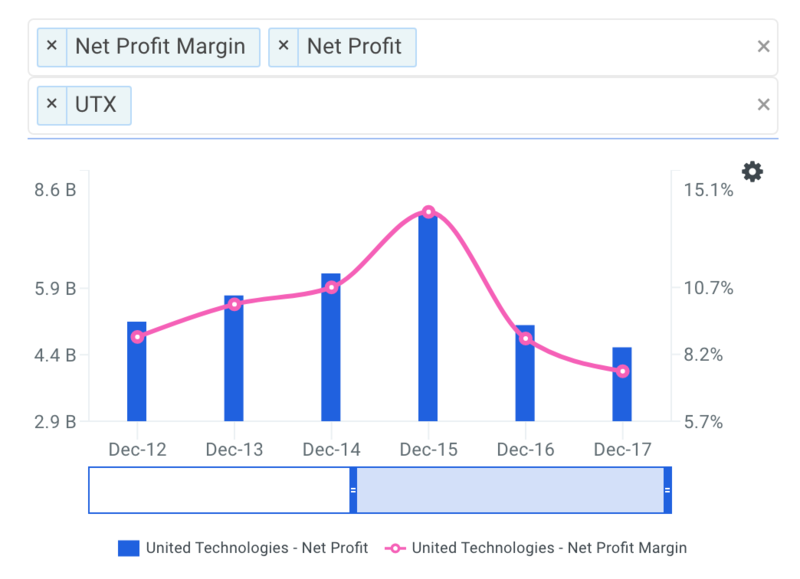 Unfortunately for shareholders, UTX's net profit margin has decreased each year since 2015. Margins decreased from 13.6% to 8.8% in fiscal year 2016, decreased to 7.6% in 2017. As a result, the company's worsening margins help explain, at least in part, why ROE continues to decline. However, let's also take a look at UTX's efficiency. 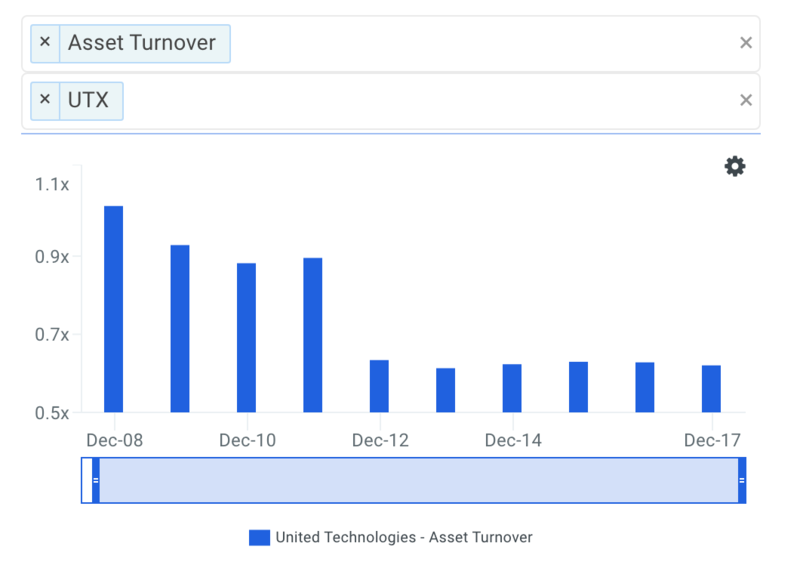 It appears that asset turnover of UTX has generally been declining over the last few years. Turnover increased from 0.63x to 0.65x in fiscal year 2016, decreased to 0.64x in 2017 and the LTM period is also its latest fiscal year. Therefore, the company's decreasing asset turnover ratio helps explain, at least partially, why ROE is also decreasing. Finally, the DuPont constituents that make up UTX's ROE are shown in the table below. 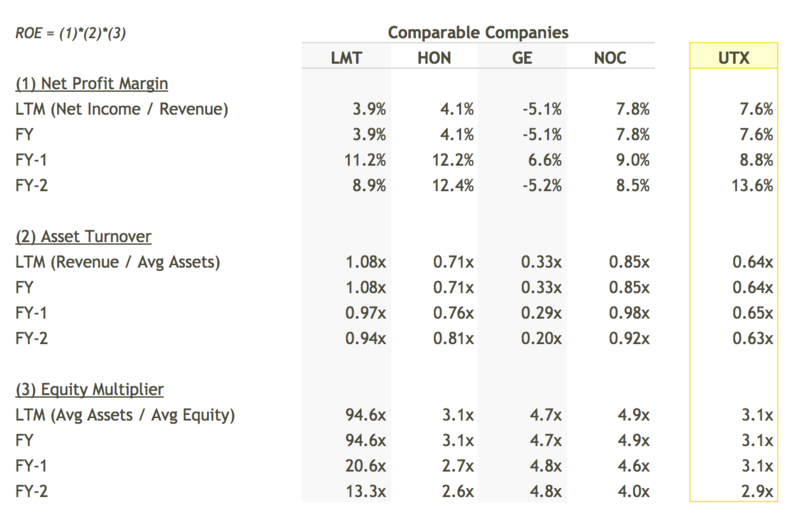 Note that the table also compares UTX to a peer group that includes Lockheed Martin Corporation (NYSE: LMT), Honeywell International Inc. (NYSE: HON), General Electric Company (NYSE: GE) and Northrop Grumman Corporation (NYSE: NOC). In conclusion, the DuPont analysis has helped us better understand that UTX's continuous fall in return on equity is the result of a steadily deteriorating net profit margin, a declining asset turnover ratio and increasing leverage. Therefore when looking at the core operations of the business, UTX shareholders have reason to be concerned due to the company's deteriorating profitability along with a general decline in operational efficiency. Forecast Metrics: what is UTX's projected earnings growth? Is the company expected to grow faster or slower relative to its peers? Analyze the company's projected earnings growth here. Efficiency Metrics: how much free cash flow does UTX generate as a percentage of total sales? Has it been increasing or decreasing over time? Review the firm's free cash flow margin here. Risk Metrics: how is UTX's financial health? Find out by viewing our financial leverage data metric which plots the dollars in total assets for each dollar of common equity over time.